Ai Weiwei, Louise Bourgeois, Carroll Dunham, Olafur Eliasson, Peter Fischli/David Weiss Eric Hollender, Bruce Nauman, Olaf Nicolai, Ed Ruscha, Thomas Schütte, Jeff Wall and others. We are pleased to present from nature, our summer group show at Carolina Nitsch Project Room in Chelsea, focusing on various interpretations of the natural world, in different media. Bruce Nauman’s 1966-67 drawing The negative shape of the right half of my body carved into a living tree suggests, while establishing a formal analogy between the artist’s own body and a tree, how nature takes over and the body ‘could not get away’ in a self imposed trap. Thomas Schütte’s Fleurs pour M. Duchamp, 2002, follows the tradition of nature printing by actually pressing flowers directly onto a plate prepared for an etching. The same process, a sort of primitive photocopy, has been used for centuries by artists and naturalists to make a “record” of nature. This appropriation also acknowledges Duchamp’s role in the invention of the “readymade”. Louise Bourgeois’ Ode a la Bievre, 2007, is a deluxe cloth book with 25 fabric panels printed with archival dyes and with embroidery and appliqués. It is a memoir of the artist’s childhood near the Bievre River outside of Paris where her parents operated a tapestry business. Each page is an abstraction of the landscape and how it intertwined with daily life and work. 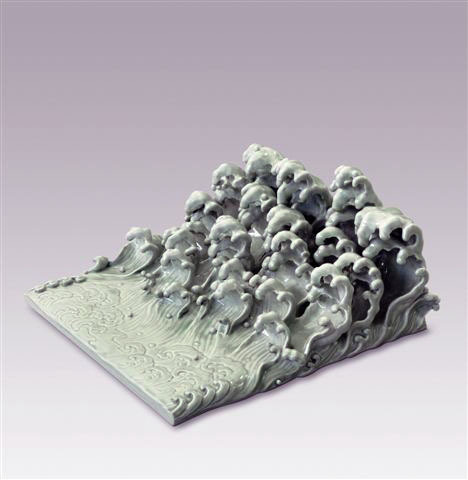 Fischli and Weiss’ Einheimischer Waldboden, 1982, is a playful recreation of a forest floor made of unfired clay. Waldboden is created in much the same way a child might render these objects; small strands of clay for worms, a fist of clay for a mushroom stump and the cap made by pressing a ball of clay against the artists palm (which also creates the „signature“). Another work using clay is A Bed of Grass, 2008 by Eric Hollender. Built one blade at a time, this piece speaks as much about obsession and tease as it does about nature and luxury. Rock Surface, 2006 by Jeff Wall challenges our perception of distance when confronted with a detail of nature; we could be looking at a rock held in our hand or the side of a mountain. 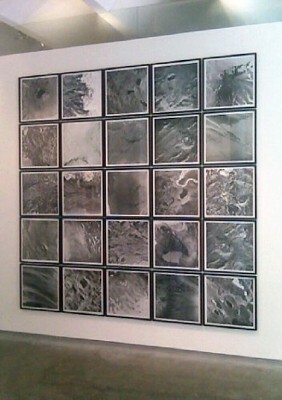 Similarly, Olafur Eliasson’s Cartographic Series I , 2001 is comprised of satellite images of Iceland. These 25 photogravures, each printed in a slightly different blacks, causes our interpretation to oscillate between micro and macro. Ed Ruscha’s New Wood-Old Wood, 2008, appears to be two wood slabs but is actually a pair of three dimensional prints made from pressed paper pulp with coloring. Full of irony (paper pulp originates from wood and both slabs are made from the same cast) the work also references Ruscha’s early assemblages of the late 1950’s in which he combined real wood slabs, paint and pop cartoon cut outs..